Havwoods’ Genuine Reclaimed Oak Rill was used as cladding at Whiskeez Bakehouse, designed by Tracy Zorich Interior Studio. Photography: Adrian Tan Photography. Havwoods’ reclaimed engineered timber is sourced from aged European wooden barns that are falling into disrepair. The timber is repaired by skilled craftspeople and turned into reliable engineered planks. 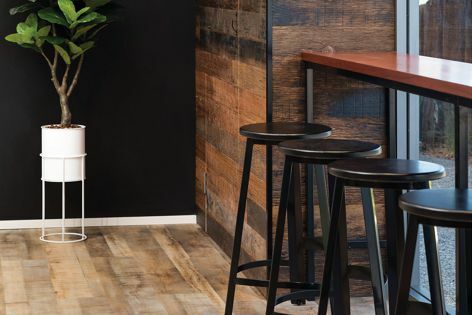 The planks can be used for timber flooring, cladding or joinery and are ideal for hospitality and retail spaces due to the durability and stability ensured by their quality craftsmanship and engineered construction.